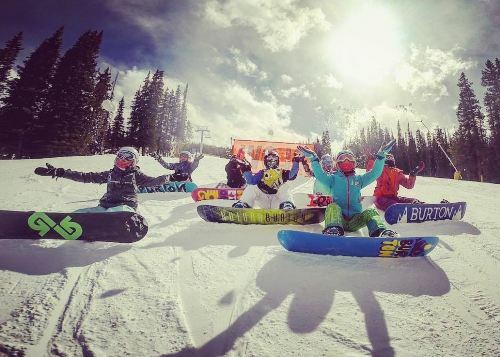 Duchess Ride: a Colorado-based nonprofit that aims to empower girls through board sports. This organization was founded by four ladies, all wildly different, but who all share a passion for board sports. Have you ever been skateboarding or snowboarding? If you haven’t, definitely put it on your bucket list! The first time I snowboarded (if you could call it snowboarding), I basically sat on my snowboard and slid down the hill. But once I got a hang of it, I was able to challenge myself to take the harder routes. The adrenaline you get as you go over the hill, the wind rushing past you face, the speed your moving forward with – it’s an eye-opening experience. As the founders of Duchess Ride describe it, when they were on the snow, on a board, they felt uncontainable. Applying this ‘uncontainable’ approach to everyday tasks off the snow, doors opened and these women realized that the possibilities are truly endless. We hear all the time that the sky’s the limit, however, sometimes, we don’t know how to get over the ceiling above us in order to reach the stars. 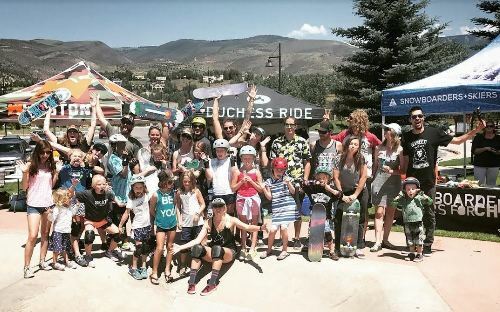 At Duchess Ride, they show the next generation of sisters how to worry less about fitting into the glass slipper (read the story here), and more about shattering glass ceilings. What an inspiring motto to live by! While Duchess Ride is an organization specifically empowering women, I believe their mission and values apply to all people, young or old, boys or girls. Today, we have the opportunity to hear more and be inspired by one of their founders, Claire. They say to be tenacious, to be creative, to be a teammate. They say dreams are possible, but they don’t just happen – so let’s hear more about how we can make those dreams reality! Amazing Kids (AK): What inspired or called you to create Duchess Ride? Claire & Carly (CC): The inspiration for Duchess Ride came from friendship and progression. Snowboarding and skateboarding are such a male dominated sports that often women feel left out, disconnected, and sometimes even avoid it for the embarrassment of falling in front of a bunch of guys. But when we rode together it felt different. Riding with other girls changed our understanding of what we could accomplish. 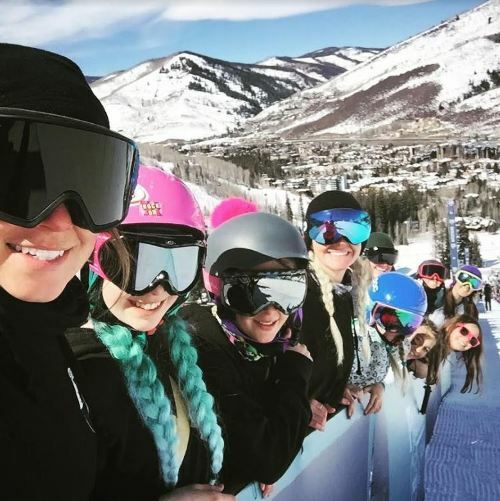 When Duchess Ride was still just an idea that we talked about on chairlifts, we knew how incredible it felt to ride with other girls and we wanted to share that. To give young girls an outlet, a network, a safe place where they could feel free to ride without being judged. AK: In your mission statement, you describe an ‘uncontainable’ approach to life. What does this mean, and how has it changed your own life? CC: Women and girls since forever ago have always been put into constructs, ‘girls should do this, and act this way, girls if they want to be liked should be like this, and a girl can’t do that.’ In short, we thought this was garbage, and we wanted to take an approach that inspired a sense that we won’t be contained by what anyone thinks. In our own lives I see it all the time. So many times as a woman and a new nonprofit, people have obvious doubts. In 2015 four of us set out to do something never been done before. The whispers of skepticism were tangible even within our circle of friends. But the most memorable of critics was one guy who approached us the night before we started. He told me to my face that we couldn’t do it because we were women. Our goal, to skateboard 300 miles down the Pacific Coast from Santa Barbara to Mexico. I’d say it changed our lives by changing our thought process. We wanted to share the idea that women don’t want to ‘fit in’ or be contained by any box or idea. That we were going to do some pretty incredible, sometimes crazy, but definitely amazing things. To that guy at In and Out. We did it. Yes. All 300 miles of it. AK: How did you take this idea and turn it into a nonprofit with such a great impact? What was it like to work with a cohort of other driven, like-minded women? CC: Turning our idea into a nonprofit has taken some time. But we did it one baby step at a time. We have learned so much about what it takes to start a nonprofit and have used a lot of the community to guide us through the process. It hasn’t all been easy though. We have failed a lot, like a lot, a lot. For example we have done a lot of things that we thought were very important and in reality were a complete waste of time. The saying two steps back one step forward comes to mind. But nevertheless, we persisted, and we have come to be an established program here in Eagle County. Working with driven, like-minded women is so incredibly refreshing. The idea sessions, the creative concepts, the pure inspiration of cultivating something with a mission of our own is so fun and exhilarating. Some meetings we leave feeling like revolutionaries! Running the program and being with the girls was and continues to be the most fun part about Duchess Ride. Seeing the smiles on those faces knowing that each one of those girls is stoked to be there. It’s priceless. Unfortunately, the logistics of running a nonprofit is not nearly as fun. Office work to us, is mind melting. Our cohort of driven women was amazing but none of us knew anything about nonprofits, and with four heads in the ring that was definitely tough. Working with friends can be really great and rewarding but they can also be testing and emotionally exhausting. AK: Do you have any advice for students who are nervous to get started with a board sport? CC: Our first advice is, “You got this.” We all know that starting something new can be overwhelming and frightening but as we coach our kids through overcoming their fear, the first step is to take a big breath, and tell yourself, ‘you got this.’ Once you get going you’ll notice more and more that if you start small you can accomplish a lot. Go at your pace whatever that might be and most importantly, have fun. AK: What can young girls expect during your program? Any before and after stories you can share? CC: The girls in our program can expect to learn more about themselves, learn more about other girls in their community, and cultivate a sense of capability. Our curriculum includes drills and games on how we overcome fear, how we understand our emotions and how they can really affect our thoughts and actions. As the camps come to a close we do a lot of team building exercises that give the girls an opportunity to form friendships that last a lifetime. But if you boil it all down, we just play snowboards or skateboards, be goofy, and have fun. I’d say our typical before and after story for most girls whom have gone through the program is this: The girls initially decide to give it a try. They are nervous, unsure, and timid. 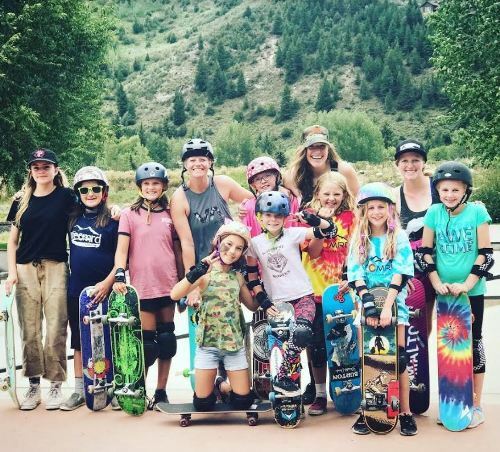 One girl even said on her first day of skate camp that she had come with the intention of just doing it one day of a four-day camp. But like her she realized what Duchess Ride is about; hanging out with other girls and learning some cool new tricks. All of these girls whom are shy to start end up leaving as rambunctious, outgoing, friendly, and emboldened little shredders. AK: How has Duchess Ride changed over time, and what are some goals for the future? CC: Duchess Ride has gone through several changes over the past few years as have the leaders of Duchess Ride. We started the idea as just a snowboard camp, and the skateboard camp was just a thought. Two out of three of us didn’t know how to skateboard. Then the skate trip happened, the 300-mile one, and then the skateboard camp was a go! Each year we meet more and more new girls that have shown interest in the program and every camp we get bigger and bigger. Our biggest goal for Duchess Ride at the moment is to gain access to Vail Resorts and US Forest Service land for our winter camps. A personal goal of mine being from San Diego and surfing, is to develop a surf camp that takes girls from Colorado but could potentially be from anywhere in the states and give them an opportunity to learn about the ocean. It’s funny, when I think about it now, I sigh out loud, thinking about how amazing it would be! AK: What is the most memorable moment you have had with a student Duchess Ride served, and how has it impacted your life? CC: My most memorable moment was during our first summer skateboard camp. We were in a small coffee shop in Minturn called Sticky Fingers that hosted our off-board evenings in the past. We had been focusing on our emotions that night and had at this moment been opening up about moments in our life that have made us overwhelmingly sad. We went around and the stories that were being shared were deep and sentimental. Needless to say, there were tears. But it was towards the end of the stories that one girl opened up about her parents’ divorce, and how it made her feel. She brought up a night that she felt hopeless and overwhelmed by her sadness. Being a child of divorce myself it really struck a chord. I knew this pain and had never shared any of my own grief like this girl had. But hearing her say it aloud gave me some reflection and a little resolution to my past that I never thought I would get. It is those moments that make Duchess Ride one of my favorite places to be. Getting to know these girls and their journeys through their youth is eye opening and so genuinely heartwarming. AK: How can everyday students get involved and join this women empowerment revolution? Can boys get involved as well? CC: Everyday students from everywhere can get involved. Our vision is to have everyone progress, albeit on a board or in life. It could be every day, or every couple of days but do something that scares you,that makes you feel uncomfortable, that pushes your own boundaries and others. It could be something as simple as getting to know a friend better, talking to someone you don’t know very well, getting to know yourself better, to trying something new (board sports) and being okay if you fall or fail. We say a lot at Duchess Ride, that we all fall, but the important part is how we rise up after we fall. As for the boys, they definitely get involved. Being in such male dominated sports we need the boys to help by offering encouragement. 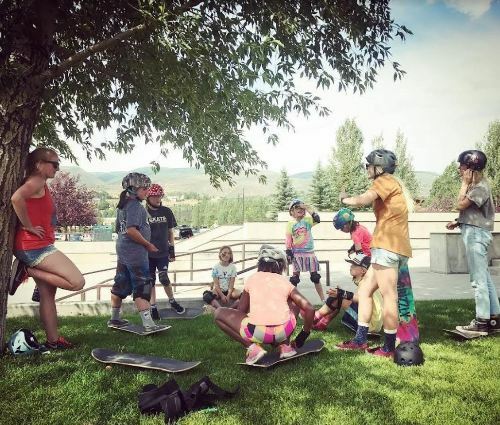 One of my favorite moments last summer at the skate park was when a boy came and hung out with us and was impressed by the girls in our camp. He sincerely said to us, “These girls are really good!” One great thing we’ve learned about skate culture in our journey with Duchess Ride is that the community of skating is incredibly supportive. If you are at the skate park every day, kids of all ages will reach out to just talk, maybe help you learn a new trick, and even celebrate with you when they see you succeed at something you’ve been working on. AK: What is one piece of advice you would give to a student that you wish someone would’ve told you earlier? AK: Who has been a mentor or confidante to you throughout your life or experience with Duchess Ride? CC: Duchess Ride began in part because none of us felt like we had a mentor growing up. We all longed for a person who cared about us, someone we looked up to. Growing up can be tough and we all know that when we start to mature sometimes our parents can seem like the last person we want to talk to. Our program is designed to be a mentorship program for that reason, so that these girls feel like they have someone else in their lives that they can depend on and trust. As for our experience with Duchess Ride our mentors have been members in our community. In the beginning we reached out to several nonprofits in our valley for advice and they all supported us from the very beginning. It has been so great to have other nonprofits support because they know we are all in this together to hopefully create an impact and change in our world. We are revolutionaries. Thank you so much Claire & Carly for taking the time to share with us your amazing insights and experiences with Duchess Ride! To all individuals reading this right now: I hope you feel empowered to dominate your dreams and creak some glass ceilings. I know I’m definitely inspired!